Are you a fresh salad eater? Have you purchased Dole lettuce in the past few months? If so, you need to read this! 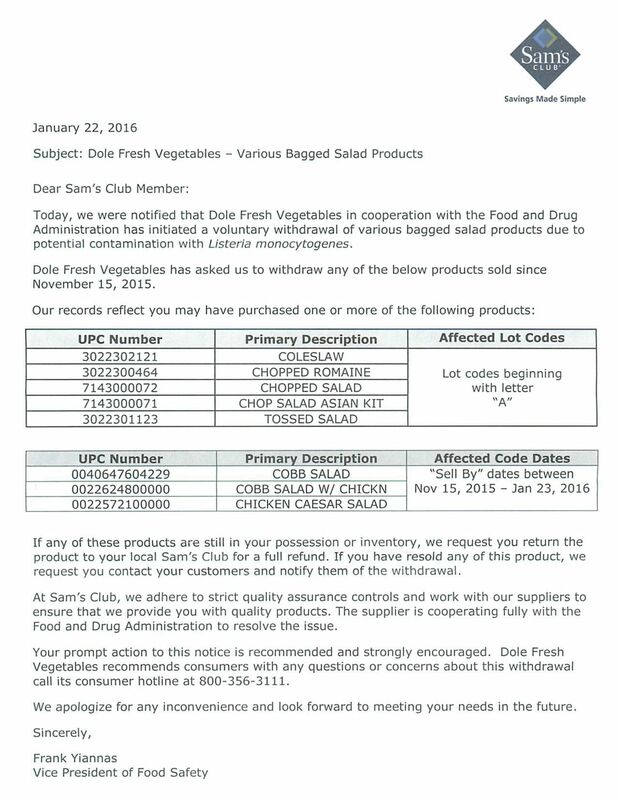 On January 27, 2016, The Centers for Disease Control issued a recall after Dole Fresh Vegetables, Inc. contacted them to provide information on the source of the most recent outbreak of listeria. The outbreak began at a processing facility in Springfield, Ohio. Although, Dole had previously issued a voluntary withdrawal of products from the market, an actual recall had not been issued until that date. Dole began to coordinate with state and federal officials to identify where the affected products were located and how they could be efficiently removed from shelves to reduce the number of customers that come in contact with the infectious disease. The affected products were not only distributed under the Dole name, but included Fresh Selections, Simple Truth and others. (For information on specific products, please visit cdc.gov) Dole asked customers to not eat the lettuce and carefully destroy the product in a manner as to not compromise other foods. At this point, all of the impacted lettuce has been removed from shelves and the facility has been temporarily shut down for further inspection. Retail locations that sold the tainted lettuce in our area included Sam’s Club, who notified its customers by mail upon receipt of the information from the CDC and Dole. The notification letter from Sam’s Club asked shoppers to be aware of the symptoms of listeria, a serious infection, that can be life threatening. They include meningitis, fatigue, aches and bacteremia, of which impact those with a weakened immune system, including older adults, pregnant women and newborns. In extreme cases, hospital stays and antibiotic treatments are required to fully recover from the illness. Sam’s Club and other retail locations have fully complied with the recall and have provided an abundance of information to their customers. However, many customers may not have received proper notification, or may have already eaten the lettuce before they received notice. Food poisoning is a very serious matter that can affect each person in different ways. If you need additional information or you have concerns that you or a loved one may have been affected, do not hesitate to contact our office, we will be glad to get you the information you need.